Yukon Shine Distillery is a small craft distillery located in Whitehorse, the capitol and largest city in Yukon, Canada. Yukon Shine probably would have been one of many small distilleries in Canada (including the Pemberton Distillery) that few people in the United States really know about, were it not for its appearance on Canada’s version of Shark Tank, CBC Dragon’s Den. Distillery owner and Distiller Karlos Krauzig struck a deal with Jim Treliving on the show, but it was ultimately Arlene Dickinson, a self-made millionaire and CEO of Venture Communications who sealed the deal (after the show was aired). Yukon Winter Vodka (80 proof / 40% ABV, $50 CAD/ $35) is made from a blend of two separately distilled spirits, the first from Yukon Gold potatoes, and the second, Canadian rye and barley. Yukon Winter Vodka is then filtered both through charcoal and gold (although we’re not sure how much reactivity gold really has in the mix). The nose is slightly sweet and rich with clear raw sliced potato, vanilla frosting, butter cream, and soft cereal grains. The entry carries the rich, sweet character from the nose with vanilla frosting and butter cream followed by potato chips and Wheaties. All the sweet lushness in the opening balances out well in the midpalate, which features fresh ground black pepper, caraway, and a touch of lemon rind. 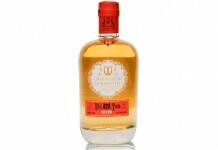 Yukon Winter Vodka’s finish is long and slightly dry with just the right amount of spice. There are a lot of nice flavor notes at work in the Yukon Winter Vodka and they fit quite nicely together. 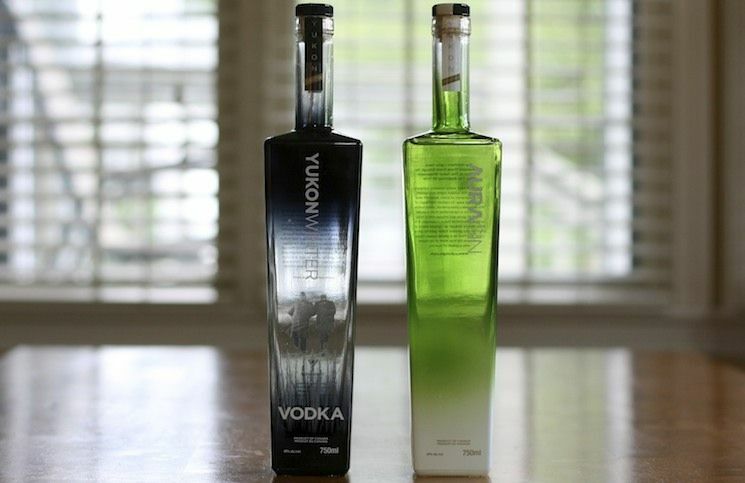 We like the sweet and lush approachability of this vodka and like how it manages to continue to be affable while not abandoning the classic structure of vodka. There’s enough spice and a solid enough finish to give Yukon Winter Vodka a great deal of mixability, while still being crafted well enough to enjoy over ice or with a splash of soda water. AuraGin (80 proof / 40% ABV, $50) uses the same spirit base as Yukon Winter Vodka and macerates it with fresh grapefruit, lemon, and lime directly before re-distilling the mix using a botanical basket that has 12 botanicals including juniper. The result is a fairly sweet and citrus-forward nose that’s in the universe of a lemon-lime soda like 7Up or Sprite. The juniper is there, but it quickly dissipates, and after sitting for a bit the nose becomes all citrus. The entry for AuraGin is as soft and lightly sweet as the nose and tastes more like a citrus vodka than a gin. It isn’t until the midpalate that the botanicals really emerge, and when they do, the juniper takes front stage along with white pepper, grains of paradise, cardamon, and cinnamon bark. The midpalate is unexpectedly spicy and really helps balance what we thought would be a greatly lopsided flavor experience. The finish is long and dry, and does a solid job of combining the citrus from the entry, now reading clearly as citrus peel with the spice in the midpalate. Using potato in the base spirit for a gin is a challenging move, as the soft and round elements which are nice in the mix for a potato vodka become a hindrance in making a balanced and clean gin, but Yukon Shine Distillery has managed to defy convention and balance the potato’s rich and soft characters with the right blend of rye spice and botanicals. As with Yukon Shine’s Vodka, AuraGin manages to be approachable and extremely affable without abandoning the job it needs to do for the spirit category. 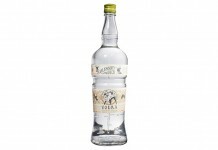 Yukon Shine has done a superb job with stunning packaging and creating quality craft spirits, although the distillery needs to abandon using real cork for their enclosures – after time, both the vodka and the gin had small bits of cork floating in them. 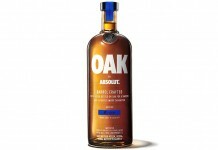 Cork issue asside, Yukon Shine has demonstrated great craft with both of these excellent products.